Among the various (and few) significant results of recent landmark whole-genome analyses (involving more than 54,000 participants) on schizophrenia (covered here and here), there was really just one consistent result – linkage to the 6p21-22 region containing the immunological MHC loci. While there has been some despair among professional gene hunters, one man’s exasperation can sometimes be a source of great interest and opportunity for others – who – for many years – have suspected that early immunological infection was a key risk factor in the development of the disorder. Such is the case in the recent paper, “Prenatal immune challenge induces developmental changes in the morphology of pyramidal neurons of the prefrontal cortex and hippocampus in rats” by Baharnoori et al., [doi: 10.1016/j.schres.2008.10.003]. In this paper, the authors point out that Emil Kraepelin, who first described the disorder we now call schizophrenia, had suggested that childhood inflammation of the head might be an important risk factor. Thus, the immunopathological hypothesis has been around since day 0 – a long time coming I suppose. In their research article, Baharnoori and colleagues have taken this hypothesis and asked, in a straightforward way, what the consequences of an immunological challenge on the developing brain might look like. 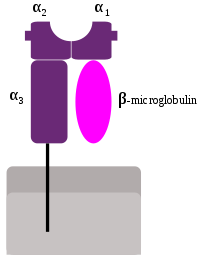 To evaluate this question, the team used a Sprague-Dawley rat model and injected pregnant females (intraperitoneally on embryonic day 16) with a substance known as lipopolysaccharide (LPS) which is known to mimic an infection and initiate an immune response (in a manner that would normally depend on the MHC loci found on 6p21-22). Once the injections were made, the team was then able to assess the consequences to various aspects of brain and behavior. In this paper, the team focused their analysis on the development of the frontal cortex and the hippocampus – 2 regions that are known to function poorly in schizophrenia. They used a very, very focused probe of development – namely the overall shape, branching structure and spine formations on pyramidal cells in these regions – via a method known as Golgi-Cox staining. The team presents a series of fantastically detailed images of single pyramidal cells (taken from postnatal day 10, 35 and 60) from animals who’s mothers were immunologically challenged and those who were unexposed to LPS. Briefly, the team finds that the prenatal exposure to LPS had the effect of reducing the number of dendritic spines (these are the aspects of a neuron that are used to make synaptic connections with other neurons) in the developing offspring. 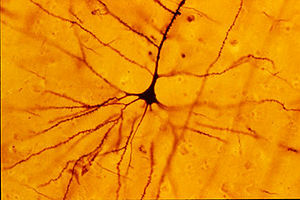 Other aspects of neuronal shape were also affected in the treated animals – basically amounting to a less branchy, less spiny – less connectable – neuron. If that’s not a basis for a cognitive disorder than what else is? Indeed, the authors point out that such spines are targets – in early development – for interneurons that are essential for long-range gamma oscillations that help distant brain regions function together in a coherent manner (something that notably does not happen in schizophrenia). Thus, there is many a reason (54,000 strong) to want to better understand the neuro-immuno-genetic-developmental mechanisms that can alter neuronal structure. Exciting progress in the face of recent genetic setbacks! Its not often that Nature magazine publishes a triple-back-to-back-to-back, so take note if you’re interested in the genetics of mental illness. The 3 papers – [doi:10.1038/nature08185] involving 3,322 individuals with schizophrenia and 3,587 controls, [doi:10.1038/nature08186] 4,999 cases and 15,555 controls and [doi:10.1038/nature08192] 8,008 cases and 19,077 controls – are as massive and powerful as any genome-wide effort to-date. The results? Overall a common result showing linkage to the major histocompatibility complex or so-called ‘MHC genes’ located on chromosome 6. What to these genes do? and what’s the relevence to mental illness? Here’s a quickie immunology primer on the biological function of the major histocompatibility genes. They encode proteins whose molecular function is display short peptides on the surface of aptly named antigen presenting cells in the immune system (think of your hand as an MHC protein holding onto an apple (the short peptide) and holding it out or presenting it to someone (an Helper T-Cell). This act of “presentation” is done so that the Helper T-Cells can determine whether such peptides are “self” or “non-self”. If such displayed peptides are non-self (such as a virus, endotoxin or bacterium), then the helper T-Cells will sound the alarm and initiate a T- or B-Cell based immune response aimed specifically at the offending invader. 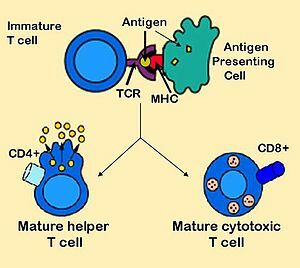 The movies below show the MHC proteins in their place displaying antigen peptides on the cell surface for binding with a helper T-Cell. The more we know, the more we don’t know. Hopefully more early environment data will be analyzed. Ahhh, if only this were true ! Sadly, not. However, it would appear that females eschewing us slovenly males may doth protest too much. Recall the popular science lab where females rank their preference to the smell of sweaty t-shirts of unshowered male classmates. Typically, this lab involves the genotyping of a number of Major Histocompatibility (MHC) gene polymorphisms and comparisons that show females prefer the odor of dissimilar MHC genotype. There are, however, well known clusters of odorant receptor genes within the MHC gene super-clusters and these may provide a more direct link from odor to preference. Liza Gross describes related findings in her article, “A Genetic Basis for Hypersensitivity to “Sweaty” Odors in Humans,” where the dosage of an olfactory receptor gene OR11H7P correlated with sensitivity to the odorant isovaleric acid. Although OR11H7P is not located within the commonly assayed MHC super-cluster on human 6p, it is a sweet-smelling step toward understanding mechanisms of female choice. To me, phylogenetics is one of the coolest ways to use human sequence diversity. I’m not an expert, but roughly speaking, the method involves looking at sequences among ancestral populations and comparisons to sequences in groups that have migrated out over space and time. In these out groups, recombination and mutation have caused genetic sequences to diverge – in some cases new alleles have been naturally selected for, and in most cases, new alleles thrived or crashed due the size and mating structure of a population. The genome carries the historical record of this change – the ultimate history book ! I recently had my Y-chromosome analyzed by the Genographic Project and was intrigued to discover a southwest asian heritage. More recently, Kenneth Kidd and colleagues report a detailed analysis of sequences in the KIR receptor gene complex on chromosome 19q13 and variation in the human leukocyte antigen (HLA) class I gene complex on chromosome 6p23. It has long been known that these regions are hypervariable, which is a good thing since our immune system exploits this diversity to counter ever-changing pathogen invasions – but how do two parts of the immune system continue to work together (KIR receptors bind to HLA antigens) when the separate, unlinked genomic regions show hypervariability ? Worse yet, if the KIR-HLA interaction is too weak, we are susceptible to infection, but, if too strong, we are susceptible to autoimmune attack. Quite a tight-wire to walk, amidst a deluge of pathogen invasions ! Kidd and colleagues use the ALFRED database to reveal some clues to the historical record of this. Apparently, the co-evolution is selective, where activating receptor (19q13) -ligand (6p23) complexes were strongly negatively selected for but not inhibitory receptor-ligand pairs.